We are a renowned manufacturers and exporters of female mannequin, chrome finish mannequin, which are highly appreciated for their lightweight, excellent polish, natural flesh tone, scratchproof surface, durability, and impeccable finish. We also meet customized requirement for our clients benefit. We provide Female Mannequins, which are highly appreciated for their lightweight, excellent polish, natural flesh tone, scratch proof surface, durability, and impeccable finish. 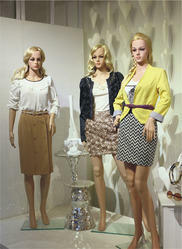 These realistic mannequins are used for displays in retails, showrooms, and shops. As per customers’ specifications, these can be customized on the parameters of raw material, size, shape and posture.